I looked at my calendar and realized that I’ve booked myself for four conventions in the next six weeks! How do I get myself into these situations?! Nevertheless, here we are. If you’re attending any of these shows, come by and say hi! This is the most informal of the four shows; I’ll be attending with no schedule or booth on the Saturday and a bit of Sunday. I’ve been going to this convention for several years now, along with its slightly bigger sibling, ConnCon, in the spring. It’s quite small, only a couple hundred people at most, but the crowd it attracts is really good. Lots of friendly and smart people who want to play games with you, and the people who run the show are very good folks. I’ll have The Networks: Executives on me, plus a new prototype or two, so if you want to play, let me know! From tiny FalCon, we go to Essen SPIEL, one of the largest tabletop-only conventions in the world. I’ll be there for the third straight year, but this will be the first year I will have my own booth. Come to Hall 2, D141 and say hello! 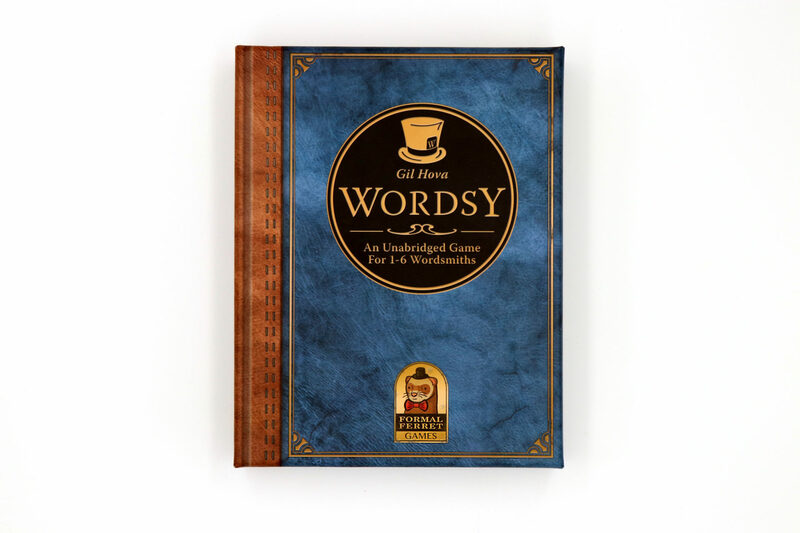 I’ll have Wordsy with me, and I’ll be offering a free translation kit so you can play it in German (as selling an English-language word game in Germany is not a great idea). It will be the local equivalent of $20 USD, so between 15-20€. The translation kit will run out, so come to my booth early! I’ll also have English-language copies of The Networks base game, plus a few copies of On the Air. The Networks will be the local equivalent of $50 USD (between 40-45€), and On the Air will be recommended 10€, pay what you want. You’ll notice I had to specify “English-language” just now. That’s because my friends at Board & Dice are offering a German version of the game! You can pre-order it for Essen pickup here. And if you want to try The Networks: Executives, I will have a demo copy with me to show off! Metatopia is one of my favorite game designer conventions. Protospiel brings together designers who can take intensive deep-dives into your prototype and make crucial early changes, while Unpub invites hordes of playtesters to torture-test your game and find all sorts of possible corner cases. Metatopia is a great mix of the theoretical and practical. On the practical side, you can schedule a bunch of tests for your game, and you’ll have some control over the demographics of folks to test it. In return, you’ll be expected to provide tests for other designers, but you already planned to do that, right? D011: “How To Demo A Board/Card Game At A Convention” presented by Gil Hova, Heather O’Neill, Melissa Lewis-Gentry, JR Honeycutt. Are you a publisher showing your games at conventions? Maybe you’re a booth helper? Join us as we discuss the best ways to demo a game at a convention. We’re not talking about teaching games in general; we’re talking, very specifically, about showing players the heartbeat of a board game in as short a period of time as possible in a noisy, crowded environment. Friday, 12:00PM – 1:00PM; Serious, All Ages. D037: “Podcast Editing LIVE” presented by Gil Hova. Do you edit podcasts, or are you looking into the possibility? Are you self-taught? Want to get better at it? Join us as we edit a podcast live in front of you! You’ll learn about noise reduction, dynamic compression, hard limiters, and parametric equalizers. You’ll also see and hear what you should edit out, what you should leave in, and what makes a good edit good. Friday, 9:00PM – 10:00PM; Serious, All Ages. D047: “Cooling Down the Hot Take: A Look at Hierarchical Thinking in Gaming” presented by Gil Hova, Jonathan Gilmour. From Jones Theory to “this game fired that game”, hierarchical thinking – comparing one thing to another in a way that ranks one as better than the other – is very popular in the gaming world. How useful is it? Are there situations where it hurts us? We will talk about the pros and cons of hierarchical thinking, and dive into why it’s so appealing to us game fans. Saturday, 11:00AM – 12:00PM; Serious, All Ages. D070: “Player in Three Persons – Studying the Theme/Mechanism Join of Board Games” presented by Gil Hova. “This game is so immersive!” “This theme is pasted on!” “Should designers start with theme or mechanism?” Lots of board game fans like to debate theme and mechanism. This panel is a technical deep-dive into the fascinating join of theme and mechanism of a commercial board game, and why the two don’t always get along. Saturday, 7:00PM – 8:00PM; Serious, All Ages. I’ll try to record all these panels, but I’m not always good at capturing them. Audio for my 2016 panels came out really poorly, although I still want to get those out at some point. As always, I will close the year out in Dallas with BGG.CON. I will have a booth, and I will be selling The Networks and Wordsy there. We’ll be only a few months from the relaunch of Bad Medicine: Second Opinion on Kickstarter, so I’ll probably have that with me as well. I’ll also have some prototypes on me. It’s going to be a wild finish to 2017. I’m looking forward to sharing it with you!